My mom makes the best chicken curry that I have ever eaten in my life. This is the second best I have ever eaten. You might be wondering why I am not sharing my mom’s curry recipe. It is because she won’t give me the recipe. It isn’t that she is territorial or anything, it is just that she cannot tell me how she makes it. 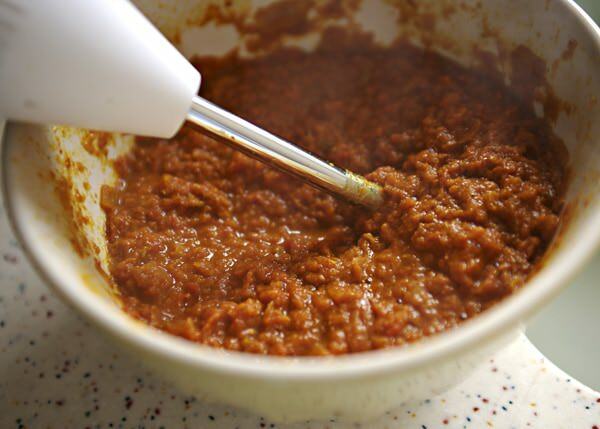 Just like Nonnie’s Meat Sauce, it is a feel, smell, and taste thing. The next time I go home, she and I are making it together and there will be copious notes and a Flip for good measure. 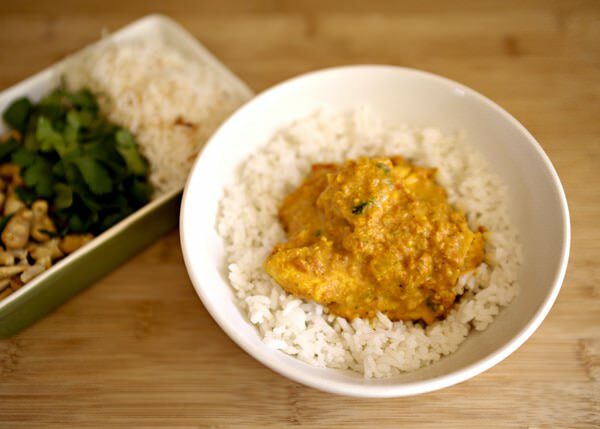 This chicken curry recipe is simply divine. It is so reminiscent of my mom’s, it tastes and smells like hers, even though the way that she makes it is so very different. Please do not be intimated by the ingredient list, it appears long, but it is easy. I had a hard time finding tikka masala so I substituted a tandoori blend and it was still amazing. I will mail order tikka masala for next time though. It comes from my new favorite cookbook, Deliciously Organic. I have made quite a few things from it since I bought it (the Thai Steak Salad and Grand Isle Shrimp are so, so, good), but I am not going to share them because I want you to buy the book for yourself. 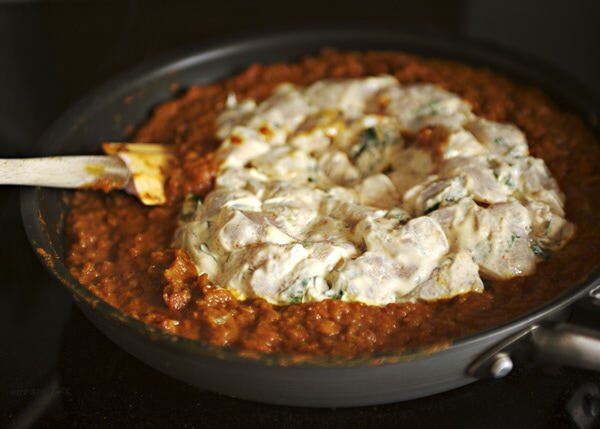 Mix together the yogurt, tikka masala, pepper, and cilantro. Add the chicken and refrigerate overnight. 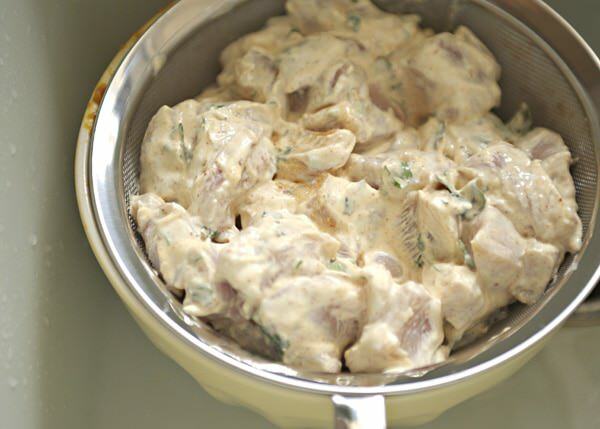 If you do not have time for that, you can let it sit at room temperature for 1 hour. Melt 1 Tablespoon of coconut oil over medium high heat. 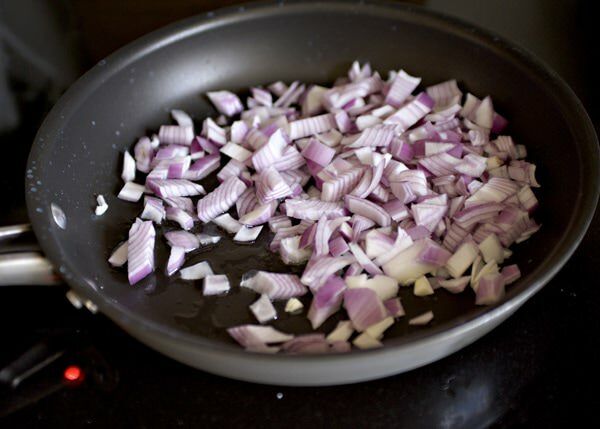 Add the red onion saute until soft and translucent, about 5 minutes. 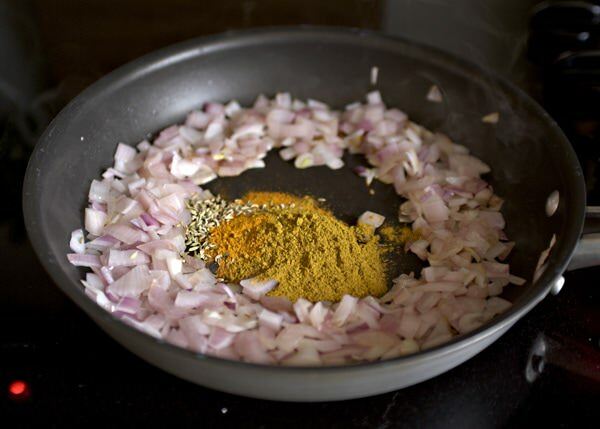 Make a well in the middle of the onions and add the turmeric, fennel seeds, cumin seeds and curry powder. Stir around in the pan for 45 seconds. You will be able to smell the spices. Add the tomatoes to the pan. Lower the heat to medium and simmer for about 8 minutes, stirring frequently. 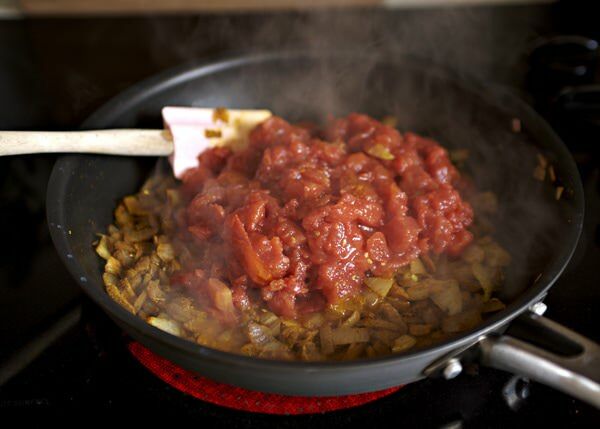 Take the tomato and onion mixture out of the pan and puree using a food processor, blender, or immersion blender. Add the puree back to the saute pan. Drain the chicken from the marinade. Add to the pan. Cook the chicken over medium high heat for 8 to 10 minutes or until the chicken is cooked through. Stir in the chicken stock and simmer for another 10 minutes. Toast the cumin in a small saute pan for about 30 seconds or until you can smell it. It really brings out the flavor, so it is worth the extra step. Add the cumin, tikka masala, nutmeg, and cinnamon to the pan. Add the heavy cream to the pan and simmer for about 5 minutes. 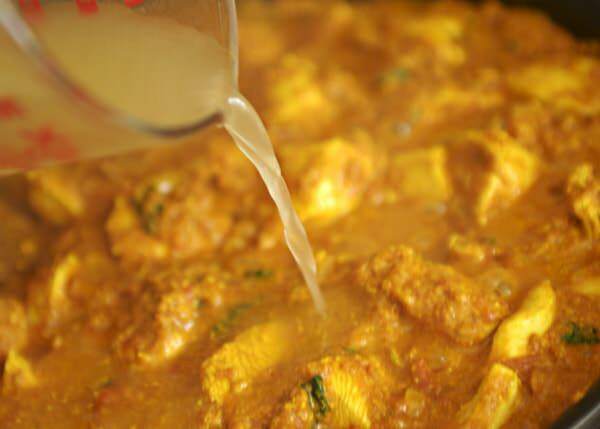 Serve the chicken curry over rice. 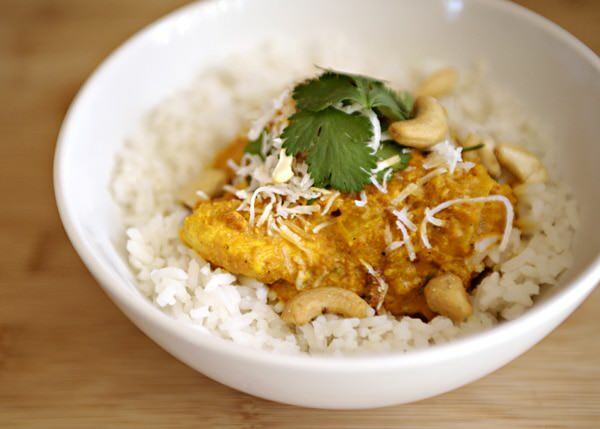 Serve with chopped cashews, chopped cilantro, and toasted coconut for garnish. This might be my new favorite dinner. I love Indian food. It is new to me too, and I crave it. Tikka? I can see garam masala but Tikka generally means the dish not a spice. I checked on Penzy’s and they only carry garam. Most of the recipes I see use garam masala. It basically has all the same spices in it already. At any rate it sounds delicious and I will certainly give this a shot. the recipe calls for tikka masala, but you might be right. I used a tandoori blend that I had. tikki masala not garum masala? the recipe calls for tikka masala. Oh, I’m looking forward to making this later this week. Always on the lookout for a good curry & the bonus, as always, is you’ve already tested and taken pictures. Do your kids eat this or is it too spicy? They ate it. It is not very spicy. You could add more heat at the end if you wanted to. This looks right up my alley. Thanks for sharing. I think I need to order the Deliciously Organic cookbook! you do, I love that book. So many good things in it. I am definitely making this!!! I can smell it from here!! It was divine. i want to make it again this week. I love chicken curry. You did a great job photographing it. Curry isn’t exactly the most appealing food to take pics of! thank you… it was pretty hard to make it look as pretty as it tastes. She (the author) was at Food Blog Camp with me this year, I only met her briefly but she was a sweetheart. This curry actually reminds me of my Nana’s version. Yummy! Totally jealous over here, I wanted to go to Food Blog Camp, it is so hard to travel with my husband’s schedule. I’m an Indian and I love chicken curry very much but I didn’t try it at home. I always go out to eat one. Now getting the fine recipe I don’t mind to try it our for myself. Really? I love making it. I love how it makes my house smell. thanks. 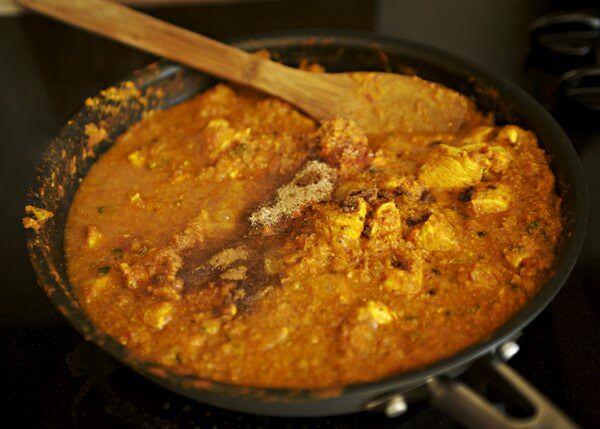 How do you make your curry? I’ve never made a curry dish before and so I’m very intrigued. I admit the list of ingredients is a bit daunting, not really *the list* but the unusual (for me) ingredients like turmeric and tikka masala. I’ve been planning on making that Masala Chai recipe off PW’s Tasty Kitchen so maybe I’ll concentrate on really boning up my exotic spices and dip a toe into the world of curry. You will be very happy that you did. 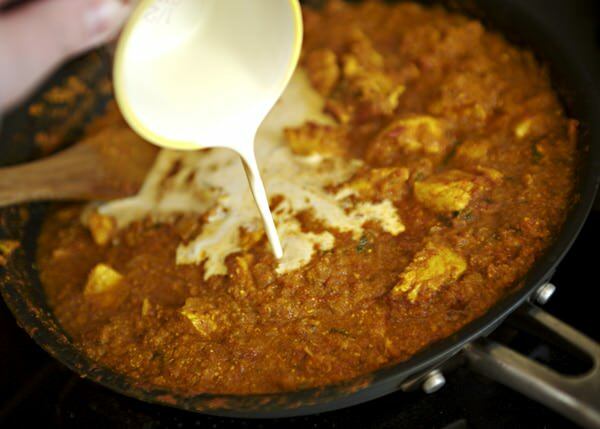 Exotic spices can make something really simple like a piece of chicken extraordinary. I made this tonight and it was delicious! Mu husband is quite the critic being from England he has high standards for Indian food. This really met the mark! Thanks! that is the highest compliment! Thank you! I love this curry. I also really love the book that it came from. can i add carrots, celery, and potato to this like traditional curry? 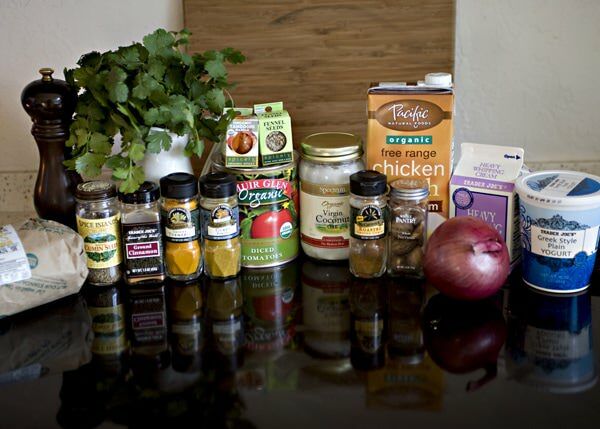 The flavoring sounds amazing…i just am going out of town next wed and have all these veggies to use up…thanks! i am from Kabul and i like to make this curry tonight. thank you for posting it. Awesome recipe and super easy! I have a big tub of yogurt and I do not want it to go bad so I used that instead of the cream (also because I am calorie counting and it was less cals and fat). I will definitely make this recipe again! Thanks! I am so glad that you liked it so much. And I bet the yogurt worked really well too. Let me tell you,you have great photography skills,your curry does look really good,will definitely try it out. I love chicken curry myself & make it quite often. You should try getting the Tikka masala at any Indian/Pakistani store,they’ll have a huge variety. thank you! I have Indian stores here since we have moved, that is a great idea to find spices. Very good but not really my version of easy. It was nice to enjoy indian food for a change and the curry powder, & spices in this one made it real comfort food. I made a few substitutions including using sour cream instead of heavy cream, a blend of different seasonings in place of the tikka masala and beef broth instead of chicken because that was all I had on hand. The grocery store was out of stock of cilantro so I used fresh parsley instead along with a dash of lime juice. 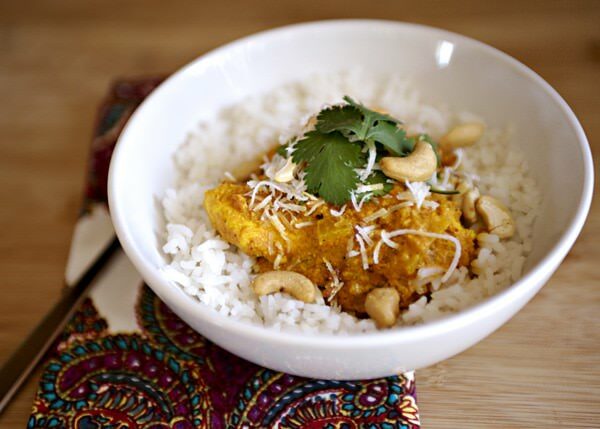 We were looking for a good chicken curry recipe, and yours hit the spot! Thank you, we loved your recipe and photos! Thank you! I am glad that you enjoyed it. I made this last night and it was excellent. The only change I made was to add some garlic and a few curry leaves at the beginning (the part with the onions and tomatoes and spices). Other than that, I did exactly as written, and it was fantastic. Nice recipe. I’m glad that you liked it so much!